We are back from a week-long family visit in Turkey. The reason for this short visit in the middle of February was to celebrate my little brother’s engagement. There is no need to miss out on the fun just because I am living miles and miles away. Right? 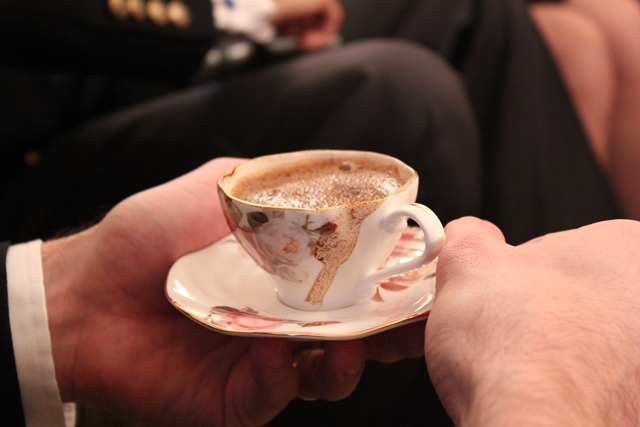 One of the highlights of this event is the Turkish coffee service. It gets tricky for the groom. Because our humorous tradition tells the bride to add salt to the groom’s coffee and watch him. If he drinks the salty coffee without showing any signs of dislike and finishes, it is supposed to mean that the groom is ready to do anything without a fuss for the bride. Since I am in the wedding mood now (no matter when the wedding is, once I am in, I am in!) , I wanted to make the Wedding Soup, as we call it. My Aunt Gülhan, made it on our last night there. I got the chance to make it again when we got sick after we got back and longed for the soup between our DayQuill and Nyquill turns. 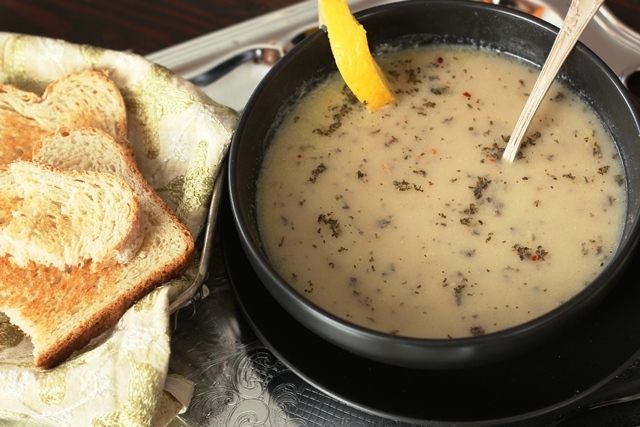 Most Turkish soups feature “terbiye” which means “manner” in Turkish. This is a final touch in soups, giving it the manners before it is served, I assume. It thickens the soup a bit and deepens the flavor. After the soup is cooked thoroughly, you let it cool down a bit. About 30-40 min before you serve it, take one or two egg yolks, whisk them with lots of lemon juice. Then several tablespoons of soup stock is added slowly to the yolk-lemon mixture, whisking quickly to cool it so that yolks don’t get cooked suddenly. After 1/3 cup of or so stock from the soup added to the mixture, you add the mixture back to the soup very slowly, again to prevent the yolks from cooking. You bring it to a simmer but NOT to a boil. Some people use whole eggs instead of yolks. However, you run the risk of cooking the egg whites and having pieces of white stuff floating in your soup because they cook much quicker than the yolks. We love the lemon flavor and actually add more later when eating. I also garnish with dry mint flakes and Aleppo pepper to give some extra kick. It helped us to recover from the jetlag and a nasty cold. 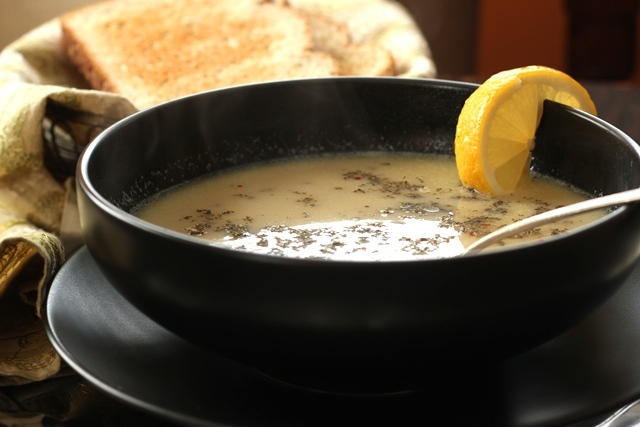 A bowl of good, hot soup is always like a good medicine. Would prefer it over DayQuill any day. 1. Diced the roast beef in small cubes. Place it in a deep pot with 6 cups of water. Bring it to a boil. Skim the foam from the surface continuously and cook until it is done.Make sure there is at least 2-3 cups of water left in the pot once it is cooked. Separate the water left in the pot and meat, measure the water. You will first be adding the water to the soup, then the meat pieces. 2. Melt the butter in a deep soup pot and add the flour. Whisking continuously, cook the flour for 5 minutes on medium high. 3. Gradually, start adding the meat stock from Step 1. Whisk quickly to prevent any clumps from forming and to get a smooth sauce. After I added the 2.5 cups of water, I used my immersion blender to make sure there was no clumps. 4. Add the meat, and enough water to bring it up to 8 cups. Add salt (about 2 teaspoons for me) and black pepper to taste. 5. Bring it to a boil, while stirring continuously so that flour does not settle and get stock on the bottom. Reduce the heat to medium-low, simmer and let it cook for another 30 min. 6. Turn the heat off, and wait for 30 min or so. 7. Whisk egg yolks and lemon juice until it becomes white and frothy. Add a tablespoon of soup stock to the yolk mixture at a time and continue whisking. 8. Once you added 1/3 cup to 1/2 cup of stock to the yolk mixture, turn the stove on to medium. Start adding the yolk mixture to the soup gradually, stirring the soup. Bring it to a slow simmer and simmer for 15 -20 min. 9. Serve with lemon wedges, dry mint and Aleppo pepper. Your sister-in-law looks so sweet, gorgeous and HAPPY! 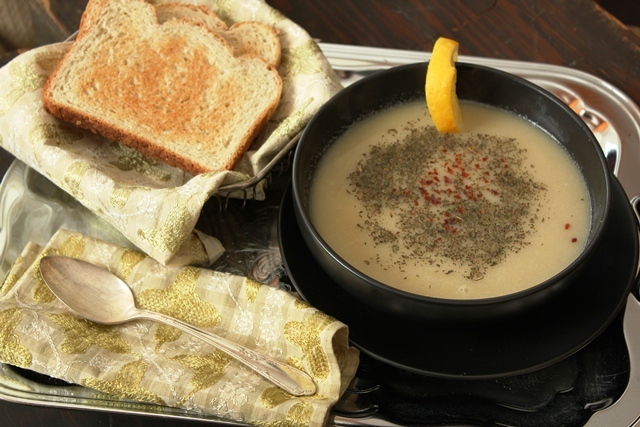 Wedding or not, I love the soup….creamy, warming and tasty. I love soups in any incarnation, and some of them (usually the ones we call čorba, (ch sound in the beginning) have the similar finish, sometimes just yolks, sometimes yolks and yogurt mixed. 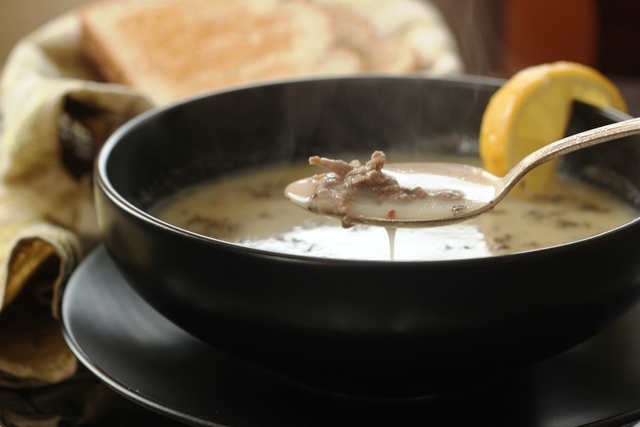 The addition makes the soups creamy and a bit tart, which is a delicious finish. Using egg yolk to thicken the soup is new to me. I made this split pea soup once which uses a cornflour + water mix to thicken. When cold, the soup turns so thick! Maybe I should try the egg yolk method on that soup! Hi Pei Lin, yolk does not thicken as much as cornflour does though, it adds some creamy look and flavor with lemon juice. Like Lana said, you can try yogurt/flour to thicken more. What a wonderful and fun sounding tradition! Congrats to your little bro and his lovely bride to be. That soup looks delectable and the picures are flat out gorgeous! Oh how fun fun fun! A wedding in the family. Could you PLEASE fit me in your suitcase when you go to the wedding? I adore weddings in other countries. I love that tradition of ‘tainted’ coffee. That is very very sweet. They are a beautiful couple! Oh, yes…the soup. I pretty much like all soups so this wedding soups looks delicious. I am so happy I stopped by your site today. My cousin married a Turkish woman and at her wedding shower we had this soup. It was so yummy. If she keeps adding whiskey and liquor in the coffee , there is no way having together even a cup again !